Today would be his 90th birthday! 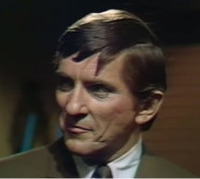 In just 10 years, it will be his 100th birthday and it's been almost a half-century since Dark Shadows was on the air. It's strange that such an old TV show still has so many fans. It is odd that so many people are still interested in a TV show from that far in the past. I've never been to any of the conventions, but the fans must all be old and gray haired by now ... unless there are young people who got interested in it from watching the reruns. I wasn't born until long after Dark Shadows ended. I started watching the reruns when I was a kid back in the '80s and I was hooked. Most of those who attend the festivals are middle-aged or older, but there are also younger people and even children who attend.